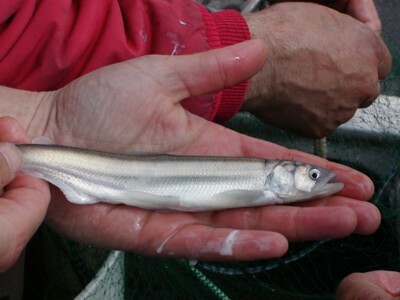 Eulachon are a small fish that have had a major historic impact in British Columbia. Also known as “candlefish”—because their oil content is so high, you can literally put a wick in the fish and use it as a candle—eulachon were a key part of First Nations’ historic diet and culture. In the 1950s, literally tonnes of eulachon returned to the Fraser River each year and were a pivotal food source for a wide range of species throughout the ecosystem. Recent years show a much different picture. Returns are so dismally low that even the test fishery used to estimate the number of eulachon remaining had to be cancelled to preserve the few remaining fish. Eulachon are an especially important food source for Fraser River sturgeon and of historic importance to the Kwikwetlem First Nation. Watershed Watch partnered with the Kwikwetlem First Nation to contract LGL Consulting Ltd. to assess the eulachon densities, migration and spawning locations adjacent to the proposed new Port Mann Bridge as part of the Gateway Program. The main findings of this project are summarized in the report Fraser River, Port Mann Bridge – Douglas Island Eulachon Study, 2009.